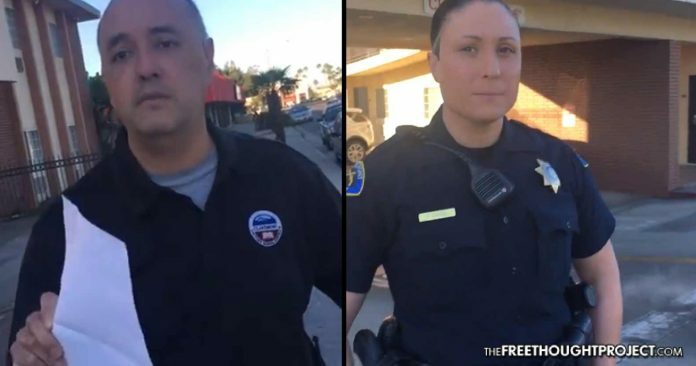 A mother was stalked and harassed by police and subsequently threatened with arrest for her choice to vaccinate her son, as she dropped him at the bus stop. A particularly disturbing video was submitted to the Free Thought Project this week showing the Orwellian implications of state-mandated vaccination laws. Porsha Rasheed was simply walking her six-year-old son to the bus stop last week when she was approached by a Claremont police officer and a representative of the school district and harassed in an attempt to find out the vaccination status of her child. Rasheed, who appears to be well-informed of her rights, did the right thing and filmed the interaction and also refused to answer their questions. However, it does not take away from the sheer ominous nature of this type of activity. Now, it appears that the enforcers of this recently enacted law are going to extreme lengths to do their job of forcing compliance—up to and including staking out parents as they drop their kids off at the bus stop. Rasheed holds strong and refuses to answer any questions which the police or school district could potentially use to incriminate her. After realizing that Rasheed was not going to give in to their bullying practices, the cop—who refused to give her name—and the school official got in the police car and left. When police and bureaucrats are dispatched out like this to enforce vaccine compliance, it speaks to the nature of the state and illustrates the lengths to which they will go to strip parents of their right to informed consent. Rasheed posted the video to her Facebook after this incident and noted that she called police to make a complaint. However, she says police were unconcerned with her complaint and instead told her that she could be arrested if she failed to vaccinate her little boy. For those that feel it is ridiculous to think that a mother could be thrown in jail for refusing to vaccinate her child, consider the following case out of Detroit, Michigan last month. For refusing to go against her beliefs and vaccinate her son, Rebecca Bredow was sentenced to seven days in a cage. Whether or not you agree with a mother’s decision to not vaccinate their child is irrelevant. While there will likely be some folks cheering on the state in these situations, how you feel personally about vaccines should never lead to a loss of freedom. No person should be forced by government regulation or societal pressure to receive any medication or treatment, including vaccines, against his or her will.